See IMPLODER SHOWER - "Self Aware Touch Sensitive VORTEX" film clip- and Graphic Details Page!- IMPLODER SHOWER Graphic Detail . No plumber needed to replace your old shower. Simply unscrew your old shower-head, screw wall mount on and connect the hose. Comes in a sleek chrome finish, with a detachable hand shower that makes it easy to direct the flow. 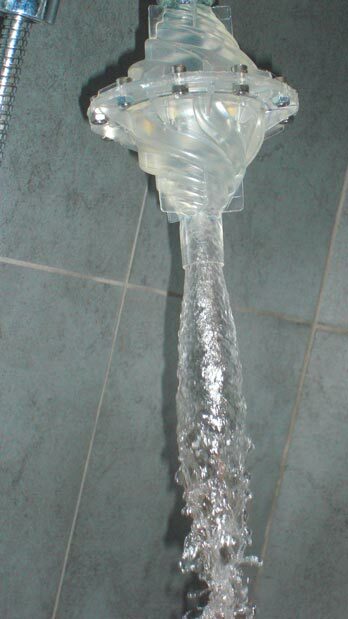 With the Imploder nozzle, you can experience the silkier feeling of vortex-spun water. The science is that once molecules are spun in water in such a way to flow centripetally, they begin to have a certain memory of connection. This is called spin coherence. 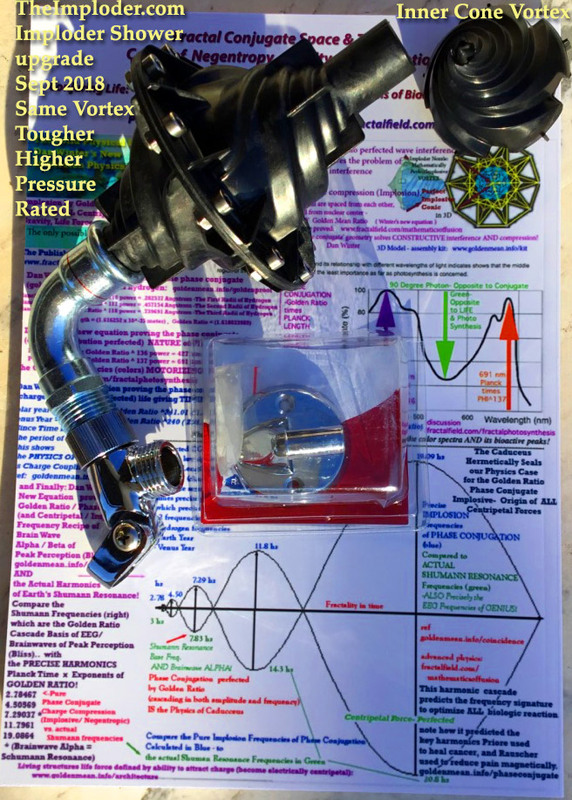 The Imploder Shower nozzle does not have the powerful magnetic array of The Imploder water treatment device, but it does have the exquisite spin geometry which installs the hydrodynamic geometry of implosion in the water's molecular memory. People using the shower nozzle have consistently reported a softer silkier feeling in the water. They talk about a sheeting action- where the water gains "laminar coherence" which is one of the key qualities of 'sensitive chaos' in water. Memory of spin is a good name for the physics of energy, mass and life-force. If your water feels dead, try the Imploder Shower nozzle and see if it doesn't feel a little more like being in a real waterfall in nature. In any case, playing with the Imploder Nozzle's - 'self aware' little 'pony tail' in the water - (see animation above) which responds to touch like a kitten's tail, is alone enough to tickle your watery fantasy. It's very powerful, and gives you a "tingly" massage feel. Where water feels dead- the Imploder vortex adds feeling of LIFE! the fortron material design etc can handle at least 50-60 psi. Below are professional to novice scientific test results that reference this product. Click titles to load testimonials below. 8 Results Total. , to view all others click here.